Clarify what is the “Plus” in REDD+, laying out the various ways in which countries have defined the three remaining activities: conservation, the sustainable management of forests and enhancement of forest carbon stock. Communicate the challenges countries face in measuring carbon removals from forests. Consider whether the rules developed to “account” for the Plus in current pay-for-performance instruments are providing incentives to increase removals from forests. And asks whether current guidelines are ‘fit for purpose’ for the Plus. Recent literature suggests that limiting global warming to either 1.5 or 2°C, or reaching carbon balance, cannot be met without significant carbon removals. Currently the only proven ‘technology’ to achieve large-scale removals is from the protection and expansion of forests. The authors intent is to help to advance the evolution of REDD+, by reconsidering measurement and accounting systems that could support incentives for the Plus activities, which are critical to achieving the goals of the Paris Agreement. Funding for this report has been provided by the Climate and Land Use Alliance with contributions from FAO. The authors are solely responsible for its content. Lee, D., Skutsch, M. and Sandker, M. (2018). 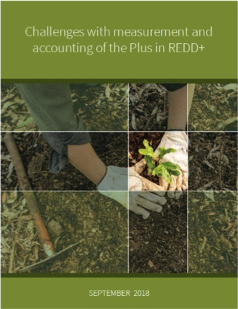 Challenges with measurement and accounting of the Plus in REDD+.